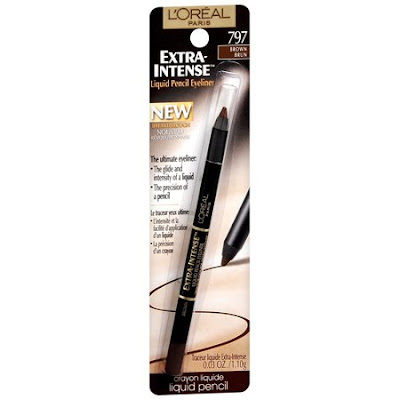 The other day I was at Target and decided to check out what was new in one of my favorite lower-end brands, Loreal. I am a big fan of their HIP products as well as their True Match foundation. One of the first new products that I noticed was their extra-intense liquid pencil eyeliner. I am always looking for great liners, so I decided to give this one a try since it was only $7 (I purchased it in black). I have to start by saying that this is a very pretty liner on. I prefer pencils over liquid liners, and this one gives you the look of liquid with the control of a pencil. 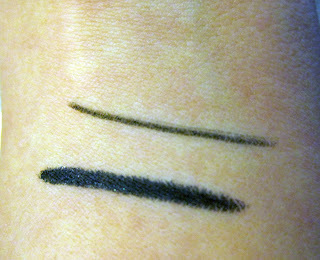 I swatched it next to Cover Girl's perfect blend pencil to demonstrate how smooth and dark the Loreal liner is. The Loreal is the bottom swatch. Here is the problem though; this liner does not want to come off. Below is a picture of my eye with the liner on. When I say "on" I mean still on the next morning after cleanser, makeup remover and baby oil were all used the night before in a failed attempt to remove it. I have dry skin right now so makeup is a bit harder to remove, but still, when I want my eyeliner to come off I expect it to come off. I would definately buy this product again and I will use it often most likely. It goes on easily and has real staying power**. It it however ridiculously hard to remove. If you choose to try it, arm yourself with makeup remover and be prepared to have that "last night was CRAZY" look for at least 24 hours after you have washed your face. **By real staying power I mean it does not come off. 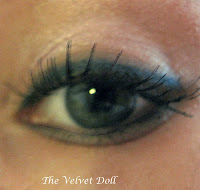 Every time I see a blog post about this eyeliner, I wanna run out and go buy it! I have the same feeling now! Especially since I never leave my house without eyeliner on...this eyeliner looks perfect! Thank you for the comment Debbi(DivaDebbi). I decided that if it looks that good the next day it will just help me get ready faster every-other day of the week! I found that this was cheaper at Target than CVS, but only by about $1. I think i'm going to purchase this!! I've been looking for a kohl/liquid liner for yeaaaaaaaaaars!! Good post. it honestly looks SO pretty on you! Thank you Farah! And that is after I tried to scrub it off! I am wishing that they had more colors in it..